In decorating the headdress is actively used different small beads that hung on either side of the bride’s face, emphasizing her beauty. 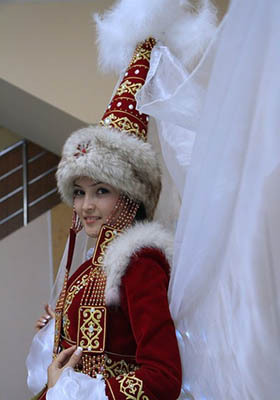 The upper part of the cap also was adorned with a lacy white veil, which was called « zhelek ». 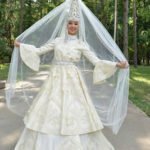 It veils the bride used to cover the face during the different wedding ceremonies. In order to better understand the significance of the wedding bride’s cap, it is necessary to imagine a simple fact. The average « saukele » in those days cost more than the whole herd of the best horses. 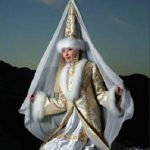 Equally valuable headdress married woman had the right to wear only until the birth of the first child. He presented with « kimeshek » After this, the bride of her husband’s mother. New headpiece accompanied by a woman before the end of her days. 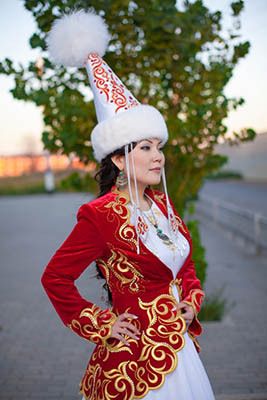 The most prominent Kazakh headgear is « saukele » – traditional women’s wedding cap. Despite the fact that « saukele » is produced on traditional canons, today it is impossible to find two identical bride hats. The basic principle of « saukele » – height, reaching in some cases, almost seventy centimeters. 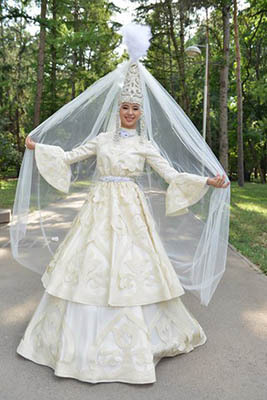 Height headdress directly dependent on the veneration of the ancestors of the bride traditions. Also, « saukele » demanded of a young bride to bow deeply, entering the house of the future spouse, thus showing respect to the new house. 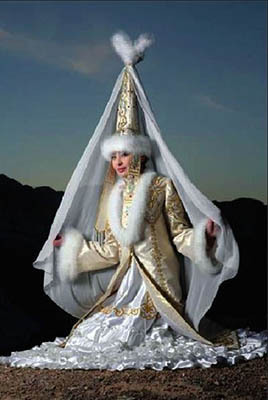 With the traditional headdress of Kazakh bride is connected and another very interesting tradition. 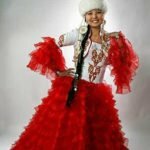 There is a belief that by touching with a bow cap « saukele » home hearth, a young bride would be the source of many benefits and long harmonious life in the family. 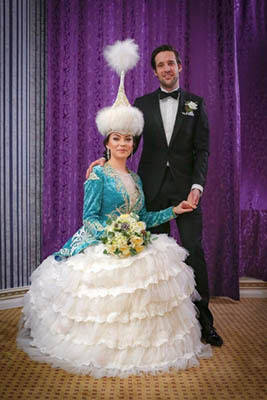 The head of the bride dress, made out of the highest quality and expensive fabrics, was the largest expenditure article of any wedding ceremony. Decorated « saukele » with precious metals and precious spun. 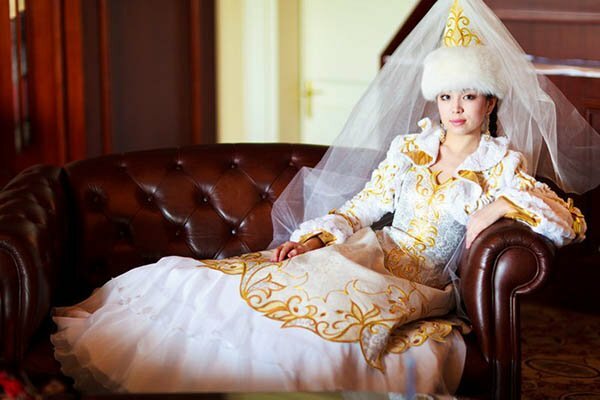 If the bride was represented by a rich family, then it is always a headdress decorated with rubies, emeralds and so on. If the girl was from a poor family, in this case, she gave the last, so she can decorate her wedding hat. For example, it is not used the wealthy bride turquoise or carnelian. Create « saukele » by hand. 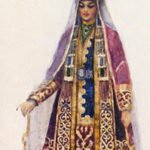 Professional seamstress used in the production of expensive furs and fabrics, and goldsmiths were engaged in the manufacture of small decorative items made of precious metals. Also, jewelers, based on an order made, can create a variety of artistic composition of the gold or silver jewelry. Today we can confidently say that in the late nineteenth century, the cost of individual « sakule » caught up with the price of the whole herd of the best racers. The cost of that in our days may seem unreasonably high, it was the best sign in years. People then did not spare the money when the thing was really high quality. 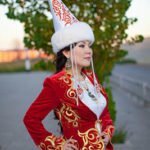 Even more surprising to his contemporaries seem that bought headdress Kazakhs never worn a second time. There was a certain tradition associated with women’s hats. 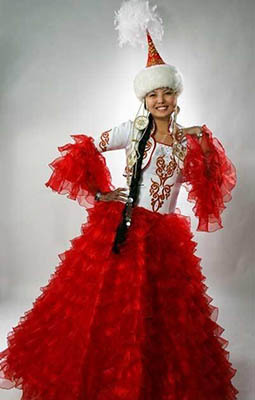 Immediately after the marriage the wife changed the traditional « sakule » on less lush « Kasaba ». 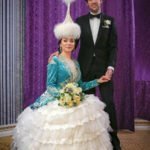 New headpiece accompanied by a woman before the birth of the first child, and then gave the wife a mother daughter headdress « kimeshek » that stayed with her for a lifetime. Headgear completely covered the neck, the hair and the head of a woman. 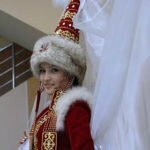 More recently, a group of Russian ethnographers managed to decipher the meaning of one of the wedding covered, which is known under the name « zhelek ». Here an experienced seamstress could not encrypt just wish the newlyweds, but this parable. In the central part of the composition is the house where the fireplace is lit, and over by the house bright sun shines. Near the house are walking black and white geese. Frames the entire composition bright rainbow.